The primary objective of this chapter is about innovation within specific social organizations, which compacts with the division of labor, knowledge creation, and the use of technology such as e-enterprise in social economy aimed at improving productivity. A significant proportion of the world’s economy is organized to make profits not only for investors but to sustain the employment of many disadvantaged people throughout the world. It includes cooperative organizations, foundations, and many other social enterprises that provide a wide range of products and services across the globe and generate sustainable employment. Productivity tends to increase when the job is divided into manageable portions and then performed by adequately skilled personnel. In order to succeed in an environment in which other businesses fiercely compete along with social enterprises, it is imperative to take into account innovative systems such as e-enterprise to leverage competition and increase productivity. It can imply the utilization of tools to allow the company to trade the entire time, or it can imply innovative thinking that promotes the development of techniques and methods based on a template that may augment increased productivity. The e-enterprise know-how also can be described as software that allows the processing of business transactions in very safe environments. Operating e-enterprise requires highly structured skill-sets acquired from years of learning and practicing. In the end the discourse concludes that technology-savvy organizations can reason and perform complex tasks leading to increased output. An entire organization ideally will be able to know what needs to be mastered to make e-enterprise expedite the goods and services needed by the consumers and giving the company the opportunities to effectively exploit the market. 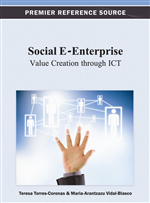 E-enterprise and its compatible technologies may benefit the social economy in many respects. The businesses will allow communities of practice to learn, change, and improve all the time, certain jobs can be completed by a stakeholder from the comforts of his/her home and video conferencing technology which can come as part of a package of e-enterprise can make it possible for donors and aid recipients to exchange information face-to-face in real time to create a co-constructed reality. The integration of such cutting-edge technologies can create more value in the social economy. This chapter addresses an interesting issue, though it would be more valuable for the scope of the book on Social e-enterprises if authors could focus on social organization. However Social enterprises include all types of health and welfare services providers, not-for-profit corporations, and consultants, who provide information, research, best practices and build capacity. They will benefit from this chapter because it offers change management methods and technology that can be applied to build useful organization. A social enterprise directly addresses an intractable social need and serves the common good, either through its product and services or through the number of disadvantaged people it can employ. To enable this to successfully happen, social enterprise must be effective and efficient in the provision of its services and products to customers and need to embrace change in order to grow. Organization development methods and technology such as Appreciative Inquiry (AI) and Community of Practice (COP) and the Theory of Structuration (TS) can be applied to benefit social enterprises. For example the AI technology can be used to create the knowledge required in useful organization and the COP ontology can be applied to build effective capacity. The three systems can be juxtaposed to advance the competitive advantage. Is Appreciative Inquiry useful in creating the knowledge and skills required in successful social societies? Can a community of practice advance the interests of a company in a social economy?